According to a new study from the Tibet Meteorological Bureau, Tibet's average annual temperature is rising faster than anywhere else in the world, reports Xinhua , China's state-run media. The report says a weather study on “Tibet's Climate and the Global Warming Trend” shows that the average annual temperature in Tibet is rising at a rate of 0.3 °C every 10 years, which is higher than that of China and the rest of the world. The average temperature of China has increased 0.4 °C every 100 years. A recent report on climate change by the United Nations' Intergovernmental Panel on Climate Change (IPCC) says that temperatures worldwide have risen 0.74 °C in the past 100 years. Last winter, the average temperatures in different regions of Tibet were 0.5 °C to 2.8 °C higher than in normal years. The whole region's average temperature was 1.6 °C higher than normal. Four of Tibet's five warmest winters in the past thirty-five years occurred since the year 2000. The average temperature of Lhasa, the capital of Tibet, increased from 7.7 °C in the 1970s to 8.4 °C in the 1990.s, and was 8.9 °C during the past six years. 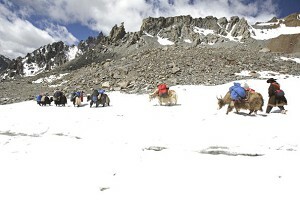 This report takes into account the most up-to-date and obvious signs of the climate change in the Tibetan Plateau. The ice-covered Tibetan Plateau is the source of many major rivers in Asia including the Yangtze River, the River Ganges, the Lancang River (River Mekong), the Yarlung Zangbu River and the Indus River. According to scientists, the glacier melting acceleration and snow reduction could seriously affect the water resources and long-term water supplies for all of Asia.